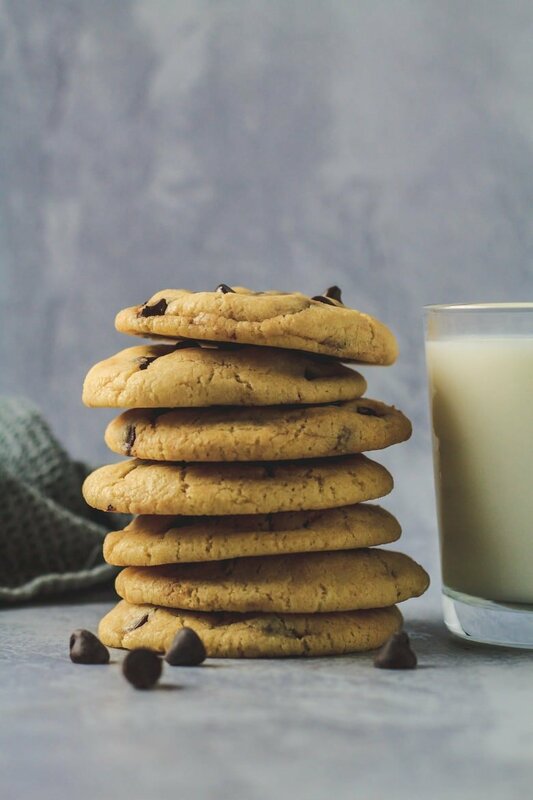 Condensed Milk Chocolate Chip Cookies – Incredibly thick, soft and chewy cookies that are made with sweetened condensed milk, and stuffed full of chocolate chips! 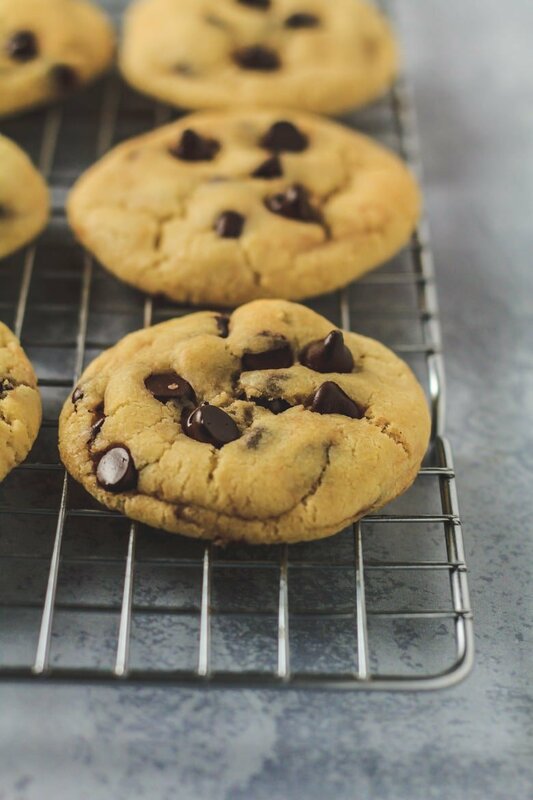 Who knew that adding sweetened condensed milk to my favourite chocolate chip cookie recipe would make them even more irresistible? Best decision ever. 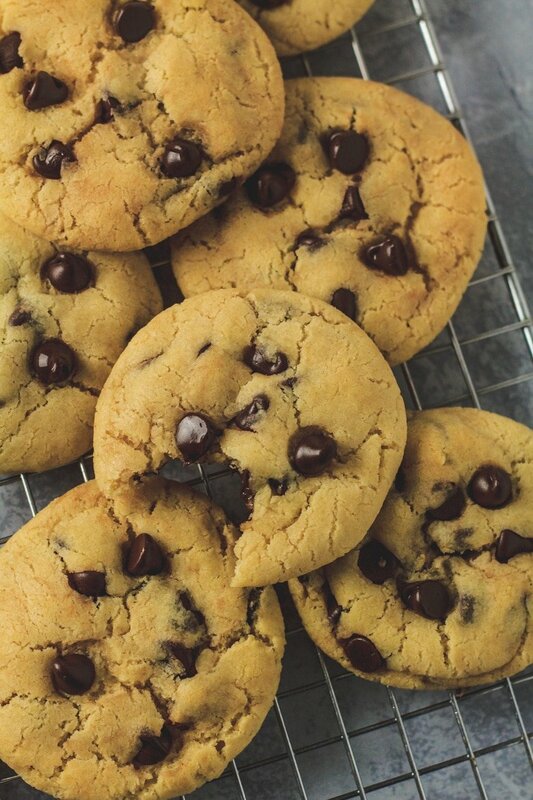 Adding condensed milk to chocolate chip cookies makes them softer and chewier than regular cookies. 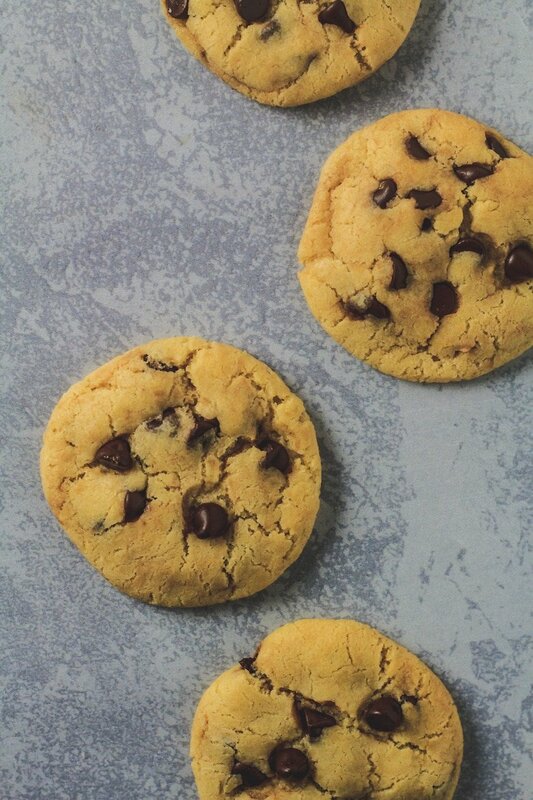 Whilst still being super thick, and loaded with chocolate chips, these cookies are just perfect. No chilling required! Looking for more delicious cookies? Check out my Chocolate Chip S’mores Cookies, Banana Breakfast Cookies, and my Peanut Butter & Jam Pinwheel Cookies. To make these cookies, start by whisking together the flour, baking powder, baking soda, cornflour, and salt. Set aside. In a separate mixing bowl, whisk together the melted butter and sugar until combined. Add the sweetened condensed milk and vanilla, and whisk until combined. Roll the dough into 1.5oz balls, place onto a baking tray lined with parchment paper or a silicone mat, and bake for 10 – 12 minutes. The cookies will look a little under-baked and soft, but they will firm up as they cool. 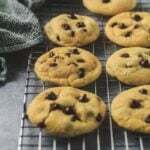 How long will these condensed milk chocolate chip cookies last? These cookies will stay fresh kept in an airtight container at room temperature for up to 1 week. 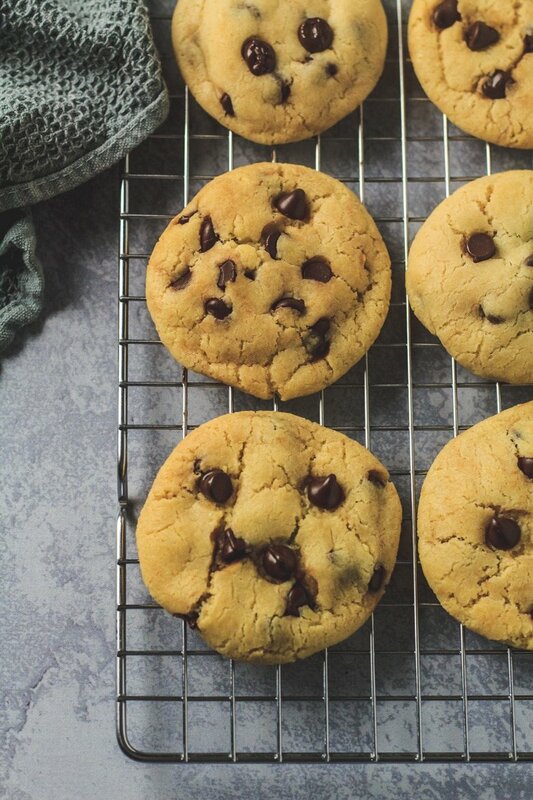 Want freshly-baked cookies every time? Cookie dough balls can be kept in the fridge for up to 5 days, or frozen for up to 3 months. Bake straight from frozen. Even more cookies to try! Whisk together the flour, baking powder, baking soda, cornflour, and salt. Set aside. Whisk together the butter and sugar until combined. Add the condensed milk and vanilla, and mix until combined. Allow to cool on the baking tray for 5 - 10 minutes before transferring them to a wire rack to cool completely. Looks yummy! Will have to try. But doesn’t adding condensed milk make them really sweet? Hey Marsha can I still chill them? Will it make a difference? These cookies look sooooo good (and the blueberry oatmeal cookies) I think I can smell them baking already! Is the brown sugar packed or just leveled? Can you taste the cornstarch? Nope! It just makes for softer, thicker cookies. It’s 530am, I just finished baking these (planned on doing them last night but realized I never pulled butter out, whoopsie) and I’m pretty sure I was dreaming about these because I woke up before 4 and got them going. The only tweak I made was the chocolate chips. I can’t measure them with a cup, that one comes from the heart. But they turned out delicious and will definitely start using this recipe more. These are delish! And so easy to whip together. I used 1/4 cup of sugar instead of the suggested amount in the recipe and because it’s Easter …I added chopped Speckled chocolate eggs..yumo! They are almost finished…need to make another batch. Thank you for the recipe! These were fabulous just out of the oven, but I give four stars due to the cookies being too hard at room temperature. They need something to make them less hard after cooling…. What would you suggest?? Maybe more butter, or some kind of liquid like milk? I’m not sure. Hi Lauren! I’m not sure why these became hard for you at room temperature. The condensed milk should keep these cookies soft for a few days. I haven’t tried adding more fat, but that could help produce softer cookies. Way too dry crumbly , I’m glad I test baked a couple of cookies. I knew I had to add eggs and try again not to waste batter. I’m sorry they came out too dry and crumbly for you. There are a lot of reasons why this can happen to a cookie recipe. 1. Too much flour. I always recommend weighing out your ingredients instead of using cups, if you do not already. You can save a crumbly mixture by adding milk, 1 tablespoon at a time. 2. Overbaking. Pull them out of the oven once they have flattened out and the edges have hardly browned. They’ll look undone in the centres, but will firm up as they coo. 3. Oven temp too high. I always recommend using an oven thermometer to check if your oven is actually the right temperature. My oven is always higher than the temp I set it to. 4. Humidity. Depending on your weather, results of a recipe may differ. You may need more or less flour than the recipe has stated. For me, 2 cups (250g) of flour is just right in these cookies. These cookies did not flatten out any, it was strange. I looked over the recipe to triple check I measured everything out right. They were very thick and the chewiness was too chewy like a raisin like chewiness. I added extra butter, sugar, and sweetened condensed milk and it got a little better. 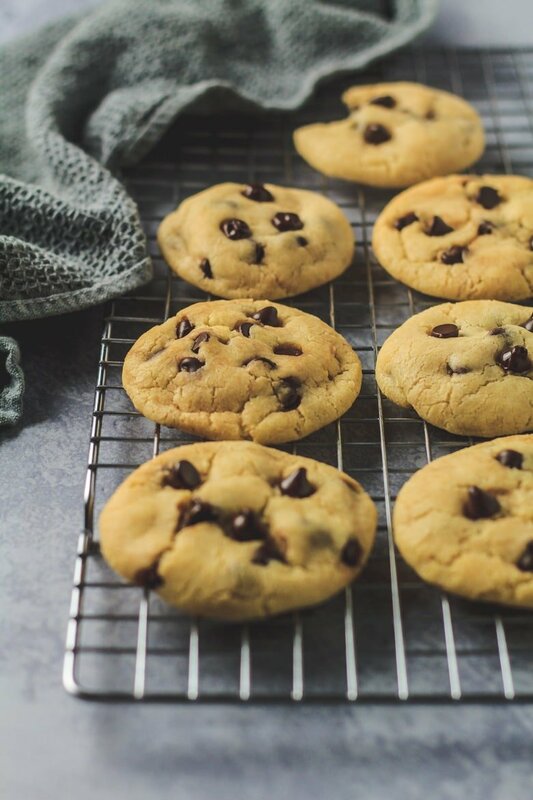 Usually when cookies do not flatten in the oven, there may be too much flour in the recipe. I always recommend weighing out your ingredients instead of using cups – it’s more accurate. If you already do that, try cutting back 1/4 cup (56g) of flour to start. Also, make sure your oven is the right temperature by using an oven thermometer. Your climate can also come into play with baking results too. You may need less flour than I do in some cases. Although 2 cups of flour is the perfect amount for me in this recipe, someone else may need to use a little less or more.